Before the iPhone, swarms of Blackberry and Windows Mobile users accessed instant messengers through a variety of different downloadable clients and websites. The iPhone, however, forces developers to create something that’s usable in the browser. 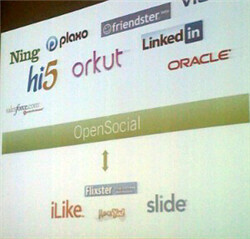 Different companies have attacked the problem with a variety of solutions. The aforementioned Meebo maintains the same desktop-like approach, while the companies listed below have each crafted separate interfaces for use on the iPhone. The below list ranks the applications overall and is platform-agnostic. All links lead directly to the iPhone application interface for our mobile readers. Enjoy! BeeJive’s JiveTalk for iPhone simply blew me away. The application was a bit late to the game, but the extra effort is apparent in their application. For days I had struggled with other IM applications which, while tailored for the iPhone, seemed to have some trouble with the included Safari browser. Login is lightning-quick and offers users the option to log on to multiple platforms at once. Furthermore, the application remembers your usernames from your last login and offers to log them on at startup. The application offers somewhat of a tabbed interface with chat bubbles in the top right corner for each of your conversations and your buddy list. A single click on a buddy list offers to IM users, and ending chats is simple as well, with a handy warning from JiveTalk. Buddy lists are cleanly rendered as well and easy to browse/use. Lastly, the service works for nearly every IM platform under the sun, including Google Talk, AIM, Yahoo Messenger, and MSN Messneger. Simply put, JiveTalk is just like the iPhone, miles ahead of the competition. If you’re IMing from your iPhone, JiveTalk’s the way to go. HeySan! is still in beta, but it somehow manages to beat most of the applications on the market. While nowhere near as fluid as JiveTalk, the service manages to get the job done. A nifty feature is the auto-logon. Once you visit the HeySan! page and login, it remembers your information and automatically logs you in. The buddy list is nicely rendered, but you have to change between lots of different pages in order to carry on a successful IM conversation. The service makes you click to a different page to send a message before returning to the conversation page. Still, if JiveTalk doesn’t do the trick for you, HeySan surely will. I can’t wait to see what happens to the service when it emerges from beta. 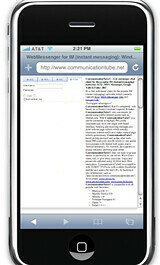 CommunicationTube supports only a small number of the lesser-used IM networks, but it’s still a nice effort at building a mobile application. The main page is rather cluttered, including far more than simply a login window. Instead, the developers saw the need to include a full explanation for how the application works and why it was created. Included is a shot from iPhoney to show how cluttered the screen really is.A separate about page could have done the job and kept the home page for CommunicationTube far less cluttered. While not tailored specifically for the iPhone, the service fits nicely when it’s used horizontally in Safari. Another drawback is that only four IM services are supported: Google Talk, IRC, MSN, and ICQ. iPhoneChat was one of the first applications I tried out on my iPhone and it’s really a proof of concept. Limited to ten minute sessions, it’s really for short bursts of IMing. When I tried to load the application today, I get a blank page with my screen name at the bottom. The service is rather temperamental, but when it works, it’s still not great. iPhoneChat also supports only one platform: AIM. FoneIM is just as questionable as iPhoneChat, working sometimes and not working on other occasions. Furthermore, the service provides an interface solely for Google Talk. I haven’t been able to get it working since the first day I tried it. Both services work only for their respective networks, AIM and GTalk. In order to become viable alternatives, they’ve got to be far more stable. There are rumors in the pipeline that Apple’s going to come out with their own iPhone iChat application shortly with a Software Update. At this point, however, iPhone users have plenty of choices. It’s amazing what can happen when Apple leaves an opening for the free market to take hold for iPhone applications. The race for iPhone IM supremacy is just heating up, and Apple may end it all with the release of an iChat application. However, if you can’t wait for Apple to launch iChat for iPhone, I recommend you use BeeJive’s excellent JiveTalk for iPhone. I know I will.